I'm sure had the game been on this afternoon he'd have been enjoying part of this milestone birthday weekend at the Turf, a place where he has spent so much of those years in a Turf Moor career that run for over forty years. There aren't many who have given our club better service and Brian, having started as an office boy, made his first team bow in the FA Cup saga against Chelsea in 1956 less than two weeks after his nineteenth birthday and that was the start of a playing career that saw him win a League Championship medal, play in an FA Cup Final, play more games in European competition than any other Burnley player and win a full England cap when he lined up against Austria in Vienna. He was an ever present in the Championship season in both league and cup, a total of fifty games, and from his wing half position he chipped in with three goals, and I bet they were from powerful left foot shots. All three of the goals were crucial too, two of them coming in draws and the other in a 3-2 win against Arsenal. Of the twelve games we played in Europe he played in all but one, missing the home Fairs Cup tie against Stuttgart through injury, and captained us in some of those ties. He also scored both of our goals against Eintracht Frankfurt in our last ever European tie. Towards the end of that Fairs Cup season of 1966/67 he came off injured during the first half of a 1-0 win at Aston Villa. Trainer George Bray was asked at half time what the problem was and he said in true George understatement, “Something and nothing.” But it was a serious injury and Brian's playing career was over, although not his Burnley FC career. 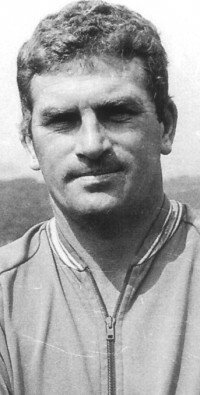 He remained with the club, firstly as a trainer and a coach, and then in 1979 he was invited to take over as manager from Harry Potts with us down at the bottom of the old Second Division. He couldn't keep us up but two years later was in charge when we won the Third Division. A lack of investment in the squad proved costly for both Burnley and Brian. We went straight back down and on Brian's 46th birthday he was sacked just hours before our historic Milk Cup win at Spurs. There was no other club for him and it looked as though his days in football were over, but just over three years later with the club at its lowest ebb he returned to face the hardest season this club has ever known. Somehow we stayed up and he began the process of rebuilding after we survived in that Orient game. He was to remain as manager for another eighteen months before handing over the reigns to Frank Casper, and for the next eight years he took over as Chief Scout before taking a well earned retirement after his 60th birthday in 1997 almost ten years after Orient. Whilst manager he had both his son and son-in-law in his squad, and since retirement he's seen two grandson's pull on the claret and blue shirt, watching proudly from the stand where he can still be seen on match days. Brian was born a Claret, served the club with great distinction, and is still a Claret to this day. It's a pity we couldn't get a game in today and win for him this weekend but from Clarets Mad – hope you had an enjoyable birthday Brian.